Holman-Climax Male Voice Choir are truly honoured by the invitation from close friends Four Lanes Male Choir to join with them and sing in a gala concert to celebrate their 70th Anniversary year along side St Stythians Male Voice Choir. The concert which is being held on Sunday 8th June 2014, is being held at Redrruth Methodist Church and starts at 7:45pm. 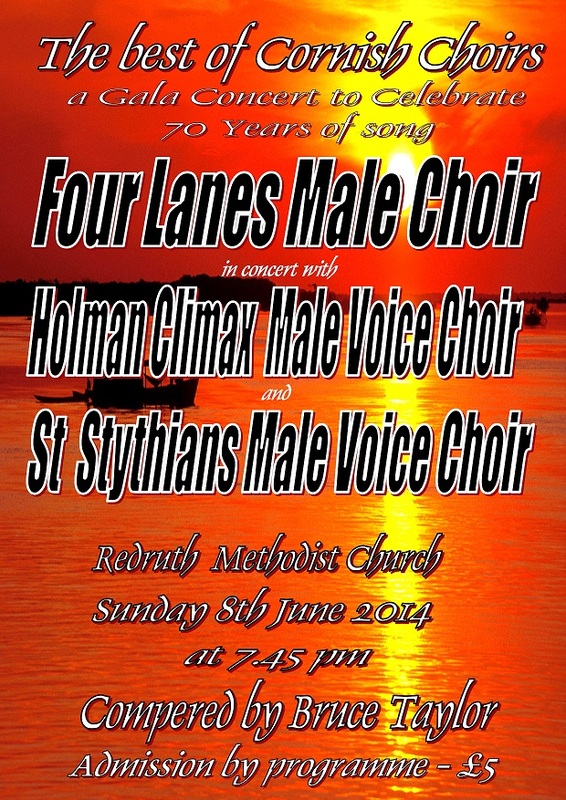 Joint concert at Redruth Methodist Church with Four Lanes Male Choir and St Stythians Male Voice Choir in Celebration of the 70th Anniversary of Four Lanes Male Choir.